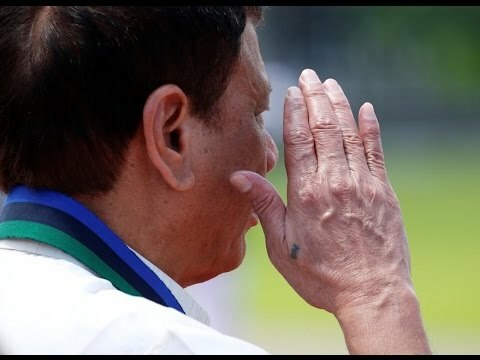 MANILA, Philippines- Have you seen the small tattoo on President Rodrigo Duterte’s right hand? More than a personal statement, the Commander-in-chief’s etching on his hand has a profound meaning that may shock you. In an article by investigative journal Raissa Robles for the South China Morning Post, Duterte’s presidential adviser on the peace process Jesus Dureza, who has a similar ink with the 71-year-old President, confirmed that the tattoo is the mark of the “Magic Group” of the Guardians Brotherhood. “We are members of Guardians Brotherhood. It’s a fraternal group of people. It started as a military fraternal group. Then they got also civilians as members,” Dureza told Robles. A former classamate of Duterte, Dureza said he is not aware when the President officially became a member of the Magic Group. The Guardians Brotherhood Organization, according to its website, was founded in 1976 originally comprised of 11 members. It was first known as “Diablo Squad” and was later on disbanded under the order of General Fabian Ver. Later on, former members formally registered the Magic Group as a “self-help group to improve soldiers’ welfare” with the Securities and Exchange Commission (SEC). But apart from improving the welfare of military soldiers, it was discovered that the group was part of nearly each coup attempt since July 1986, including the failed coup attempts between 1986 to 1998 when the late president Corazon Aquino was the head of state. This means that Duterte is part of the group that once attempted to topple Aquino and put former president Ferdinand Marcos back in power. Robles’ report also revealed that members confirm each other’s affiliation by discretely showing their hand tattoo. The placement of the tattoo showed which area the member belonged to. Interestingly, Duterte is the only Philippine president who got inked.